My local Wendy’s now sells Mr. Pibb… sorry, I mean Pibb Xtra. I think I’d like to throttle the genius who thought the kewl name change was necessary ("Pibb Xtra – TO THE EXTREME! Phear it’s l33t soda skillz, yo! "), but at least it tastes the same. For the uninitiated, it’s the Coke version of Dr. Pepper, but a little sweeter, less harshly carbonated and mmm mmm good (though not everyone shares my opinion). And any time you can get some Pibb, regardless of nomenclature, north of the Mason-Dixon line, it’s a reason to celebrate. Happy dancing will commence shortly. Why yes, it does take frighteningly little to make me happy. Tom the Dog has discovered the four-color narcotic that is Don Rosa’s “Life & Times of Scrooge McDuck,” and now he sounds hooked for life. Exxxx-cellent. One of us! One of us! Seriously, though, it's a really excellent piece of work (as is about 95% of the rest of Rosa's Disney output, but this is far and away the best), and y'all should run - not walk - and pick up Gemstone's new collected edition of this story right now. It'll make you happy. Alton Brown’s got a blog! Short, sweet and, unsurprisingly, very funny entries on food (duh), book signings, identity theft, entertainment and just about anything else that crosses his mind, all delivered in an astonishingly large font (is he concerned about the visually impaired in his audience?). His open letter to Tom Cruise is particularly amusing. And on a related note, check out Alton’s Periodic Table of Essential Kitchen Elements. I don’t know if I agree that you truly need every item on the list (I have a stove and a perfectly serviceable tea kettle, so an electric kettle is really more of a luxury than a necessity), but most of them would definitely be handy to have around. Surprisingly, though, he leaves off something that I think would be downright mandatory, the item he has often called the only uni-tasker he allows in his kitchen: a fire extinguisher. Johanna’s roast beef hash recipe sounds pretty tasty, but the initial recipe that eventually yielded the hash sounds even more delicious. I plan on trying this as soon as the local market has a sale on a nice chuck or eye roast. Gotta love crock pot recipes – simple and tasty. For no good reason, Part 1: Just because I think it looks cool, here’s more information than you’ll ever need about the Lincoln Futura (the car that became the Batmobile). For no good reason, Part 2: The Reggie Bar. I remember having my dad buy me these back in the day, even though I don’t recall actually liking them all that much. I think there was a period of about 5 minutes in the late 70s where Reggie Jackson was my favorite baseball player for some reason. Thankfully, I grew out of it. Be sure to also check out the other candy wrappers memorialized at that page, featuring the likes of the San Diego Chicken, Mr. T and Liberace, among others. 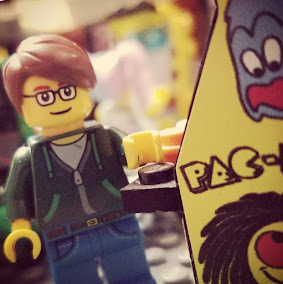 I'm sure this has been all over the 'net a million times now, but Reasonably Clever's Mini-Mizer (a Lego minifig generator) is a lot of fun and a great time killer at work (not that I'd ever endorse such behavior).